While we relaxed on their plush and comfortable couches, we watched our hosts play chef and sous chef, as they put the finishing touches on the dishes I will attempt to describe. Then we made our way to the beautifully set table, laden with plates and the requisite three glasses a person, to make the Friday night Kiddish. YC chose to share a bottle of 2011 Yarden Cabernet Sauvignon. I am very appreciative of this fact, because I am happy to say that the 2011 is clearly still ripe, and almost overripe, but a far better wine than Yarden has been creating for a few years now. Since 2008, I have found little from Yarden that I really like. Why? Well, it is clear they have made a conscious decision to make their wines a bit more ripe then they had in the past. That, coupled with overall horrible vintages for Northern Israel, Yarden has been creating wines that I have passed over for the past few years. The 2011 Cab is OK, and one that I could drink, but not one that I look forward to buying. I will try to get some 2011 Galil Yiron and see if that is also back, or is it still dead since 2009 as well. After Kiddish, we washed our hands, and were rewarded with some lovely sugar free bread that was one of those examples of perfect balance between freshly baked with a lovely crust outside, while being light and fluffy inside, while also being slightly dense and gooey as well – impressive and highly addictive! The first dish was served in combination with the next two courses, as a Pisces/Pesce combo platter – no, really they were all served separately, but they were brought to the table at the same time, given their sub-marine persuasion. The first dish was Sea Bass Ceviche – hand chopped with brunoised jalapeños, basil, evoo (Extra Virgin Olive Oil), and lemon juice. I must admit, and please understand that this statement comes after having had the other 14 courses, this was the most professionally crafted dish of the evening, and that is saying a lot knowing the rest of those dishes! You know me, I have a thing for appreciating well constructed and well balanced dishes, and this is one of those dishes that reminded me of many of Bernstein’s Pesce complex dishes. The balance was perfect and it had the addictive nature I find so commonly in those perfect dishes, the acid from the lemon juice perked the dish to an entirely different level, with the Sea Bass showing a dense structure while also being slightly cured by the lemon juice, making it toothsome with a bite. The jalapeños added the other version of bite that I and a dish like this so badly craves. It allowed for a balance to the acid and to give it a punch, while the oil elevated the bass’s unction-ness. The overall dish was truly satisfying and addictive, and if our host had served the fish in a larger dish than the Socialite accepted martini glass, I would have wolfed it all down. Blessedly, they intelligently decided against that idea, something that I am sure was probably not their first impulse, and though I am sure that the it was a difficult choice, it was a wise one given what was to follow. The next dish was served on a platter – causing me a conundrum that I proudly can say, I figured out. Instead of consuming the entire plate, I took a self-assigned version of what should have been my portion – so I am sure I enacted our hosts precise intentions when they laid out all of this wonderful dish on the elephantine platter. The dish was Sea Bass crudo, with grapefruit pulps, evoo, sea salt, and cracked tropical pepper. As we entered at the start, our hosts were “finishing” this dish with already cracked pepper and colored sea salt. Again, the ingenuity around this dish was impressive with the Sea Bass again showing well. The acid driven grapefruit became the condiment that turned the Sea Bass from a protein to a star, with the evoo doing its job and the pepper & salt bringing the entire dish together. Lovely! We paired these dishes with a lovely California white wine, that we have blogged about here many times, the 2012 Shirah Vintage whites! If I may, ah heck of course I can, it was a PERFECT pairing! The acid and sweet notes from the Viognier in the Vintage Whites, paired perfectly with heat and acid from the dishes and what a joy it was – heat, acid, balanced by sweet and floral notes but still buoyed by the wine’s acid was a slam dunk! The final fish dish was not served officially at the same time, for good reason, it does not go with the first two! Anytime you bring soy sauce like condiments into the party, you will have a hard time going back to the crudo and ceviche. So, with the introduction of Tuna Tataki – aged tuna, chopped green onions, and hoisin sauce, we had moved on to the next stage of the dinner. Now before you ask – aged tuna? Yes, you can safely age most proteins, and like all aging techniques the outcome is softer more pliable meat, but it comes at a cost to the loin, which may be very presumptuous of me to state – but it was worth it! The tuna was soft to the bite with the onions applying some bite – in more ways then one, and with the sauce adding more unction and complexity to the dish to bring it all around. Now before one of you try to guess the correct wine pairing for this dish, please do not jump to the obvious (and INCORRECT) choice of an off dry Riesling or Gewurtztraminer. Nope – those would be a VERY bad idea! Why? Because the acid and bitter notes Hoisin sauce would clash with the sweet notes in the wine. So, this conundrum called for the usage of the classic idiom – fighting fire with fire! When YC so kindly invited us, I asked for a single thing – to taste the 2008 Yarden Pinot Noir he had, and I am so happy that I was so upfront about my desire, for the both of us. Ever since tasting this masterpiece with GG at Benyo’s in August – I have been thinking about that wine, wondering and questioning if it was truly made in Israel, and wondering instead if it was concocted in France and “shipped” to Yarden to be labeled as an Israeli wine. Of course, this is not the case – but if there is any better example of an Israeli Idiosyncratic wine – then I would like to know what that is! Here you have a wine that is so NOT Israeli that it is shocking! Sure, the 2010 or 2011 Flam Cabernet is very not Israeli, but not to the same mind boggling level that this Pinot Noir is! There is no way to explain the madness that is the 2008 Yarden Pinot Noir – it cannot be Israeli but well there you have it – an Israeli wine that blew me away in so many ways! Pairing this wine with the dish was a match made in heaven, and maybe one of the most hedonistic yin and yang pairings I have had in a long time. Sure, the Pièce de résistance later in the meal with a massive red wine – was an epic pairing, but this was hedonistic more in its perfection of the pairing than in the intrinsic flavors themselves. Sure, the fish was lovely, and of course it does not compare to the beast that was to come, but the pairing was so perfectly balanced that it was truly an experience. The acid, dirt, green and black fruit notes, and the barnyard damped down the intense acid and bitter notes of the hoisin sauce while bringing up the fish’s profile that it was something that still lingers in my mind till this day! With the fish courses behind us, our host moved into the next gear while keeping a foot in the previous one, for continuity sake, with a lovely Asian Cabbage salad and Pastrami Egg roll. To be honest we were shocked by the Cabbage salad! You see, until that point we were sure, from what I know about our host, that the only green food substance in their home was Pesto! So, I am sure the cabbage salad was lovely but I was too shocked to remember! No really, the salad was very nice – very acidic and sweet – tugging on our palate’s heartstrings with the yin and yang of sweet and sour notes combined with toasted almonds to give the salad the other major food groups I so deeply crave – oily and crunchy! The only one missing was meaty – which again is the only one I was expecting all evening, but they made up for it in spades from there on out! A perfect example of a meat dish gone wild, was the next Asian inspired dish; Pastrami egg roll, because heck why not take meat, wrap it in starch and deep fry it – what could possibly be wrong with that! At times I think YC has some Tunisian ancestry that no one told him about! The egg rolls were fantastic, but to be honest the star of the rolls was the stuffing; cured and then sous vide beef cheek pastrami and sautéed onions. There was cabbage officially somewhere in the dish – but that was just thrown on there for looks and “color”, truly ignoring the previous dish, there was no need for green things anywhere in the house when you have meat like YC does! The only question I have is – how does YC survive himself??? I know this spread was outrageous, and it was, but the man eats very much like this every week – and somehow he is still amongst us! Thank goodness for that – otherwise, many others would be missing their monthly fix of meat, meat, deep fried meat, and meat, with a side of sous vide sugar and caramel! To pair with these dishes, I personally enjoyed a bit of the 2011 Savia del Sol Rioja – to see how it had changed with time, sadly it had not moved far from where it started, and that was unfortunate. Sure, it had the nice earthy notes of a Rioja, but beyond its nice acid core – the wine was a letdown – it did not live up to the 2007 vintage I enjoyed a few years ago. After that, I enjoyed more of the Yarden Pinot Noir, and a bit of the Yarden Cab to watch its evolution through the night, and it was already starting to show its sweeter tooth, but still its core was solid and mostly controlled. At this point we had clearly moved past the Asian influences and were moving into a European onslaught that would stay with us until the dessert showed up a few hours later. Our European culinary journey starts in one of the birthplaces of culinary delights, Italy, with our host’s take on a century old Italian dish of duck and grits! No, really, it was our host’s European fusion of French and Italian dishes while channeling his inner Tunisian leanings by making some lovely hand cured duck confit and pan frying gnocchi! Sure, why leave gnocchi alone when you can fry it? Come on now, this is exactly why I feel this man is Tunisian! To a Tunisian, you need only five ingredients in your kitchen, in order of quantity used; oil, flour, meat, harissa, and sugar/honey! What am I missing here?? I think this man is a closet Tunisian – and this posting is me outing the dude – sorry, YC!! This lovely dish was co-served with a Veal bacon salad, yeah, and this man is a straight up Ashkenazi, go ahead and keep trying to convince yourself – I am enjoying the irony! The veal lardons were fried chunks of fatty veal – of course, with fried potatoes (duh) – and please brace yourself – some pickled haricot vert and frisee! Seriously, I almost passed out, no, not from my heart almost exploding from the oil and meat intake – nope that was working fine. Rather, I was once again shocked by TWO vert things! Do not be worried – this was the last green thing we saw all night, but when I looked around, I was sure he must have disappeared for a second and pulled them out of his neighbor’s fridge! The dishes were lovely, complex in their structure, and impressive in their execution. These were not simple 1 to 2 hour components, the green beans and frisee must have been an entire shopping trip all by themselves! From YC’s posts to me, I can only guess that he had never seen or cooked with them in his entire life! I can only imagine the pile of dead green beans that found their way into the recycling bin! I toasted those fallen comrades with another glass of Pinot Noir that was once again a perfect match! To go with these already epic dishes, YC threw in a platter of prime rib carpaccio, with fried capers – seriously, what the heck did the poor capers do to YC??? Really, Capers! The dish was finished off with Himalayan Pink Salt and evoo. By the way, the Himalayan pink salt was really unique and lovely adding the one thing that I always BEG FOR when served carpaccio, a bite! The fried capers, salt and oil did just that! I said there were no more green things, because he fried them! There is nothing that YC cannot improve with oil! Yeah – you keep convincing yourself – go ahead! Call me after this is published, for the address to the Tunisian OA (Oil’s Anonymous) support group – I have the address; Hi my name is YC and I am a closet Tunisian!!! The fatty fried veal, actually fried everything, with the starches and the meaty carpaccio begged for earth and fruit and the Pinot Noir was perfect! Thanks again to YC and EC for all of the insane food! The dishes kept coming as we traversed Europe. We started in Italy, fused in France, threw in some Tunisian influences (yes it was French darn it!! ), and then the cherry ornament of American Hubris and you have YC’s wonderful culinary yellow brick road! Bravo my man! Now, to be very honest, at this point things get a bit fuzzy, I remember things – but they are more fleeting then concrete – think flashback followed by time lost, then back to another memory, then wine, then more blank time, and so on…. Hey it was a Friday night and it was winter in NYC, so our hosts jumped us on the yellow brick road tramway, and took us on a very quick pit-stop in the Shtetl’s of eastern Hungry. Come on, are we going to have a Friday night dinner without some chicken soup? Here is why I remember this so clearly, with everything around it a fuzzy set of lines – there was nothing fried! Now, hang on – I barely remember saying that I did not want anything other than soup, so my guess is that there was indeed some hand fried croutons and Asian inspired fried noodles! So, please do not be worried, the OA card is safely ensconced in our hosts back pocket! What I do remember of the soup was that it was warm, well seasoned and paired wonderfully with the vintage whites! Somewhere in the past hour or two, YC asked me to open his bottle of 2003 Covenant Cabernet Sauvignon, of course if you have been following my blog for anytime, you know my affections for all things California, and my new clear leanings to all things European as well. That is not to say other areas are not good in the kosher wine world, of course Israel is still the leading kosher wine manufacturer, but they have been having issues for the past 3 – 4 years. Thankfully, 2012 and 2013 have been a blessing for Israel’s white wine world, and I hope that continues with their reds as well. With that said, the 2003 Covenant Cabernet is epic! This is a wine that is 11 years old and is not showing a bit of gassed feelings. Israeli wines are all about ripe fruit (yes there are exceptions), and that is understandable given their locale and terroir. California kosher wines are really not like that, at least not from Four Gates and Covenant. Covenant from the beginning has always been about insane fruit control, lots of herb, green notes, and dense fruit structure. I am sure Jeff Morgan (head winemaker and pattern of Covenant Winery) will take affront to my comments of green, but for me, as many here know, that is a compliment and not an insult, so I am sorry ahead of time Jeff! When I opened the bottle I tasted it and it was there from the time it was opened till the time it was emptied – yes it did not survive the night, which was 100% fine with me! The wine never faltered – it was on and ready to play the second it was opened and the body was there all the way till its end. The structure was cocooned by its dirty red and black cherry, its rich forest fruit, and then the leather and spice that was showing these past few years. The tannins were fully integrated, but still sassy with a bite and a shimmy! The finish was deep, acidic, leather and tobacco bound with a heap of vanilla and more green, herbal notes, truly epic! With that said, the final entree dishes were up to the challenge, in making a full circle from the start of this post, by hopping back on the yellow brick road express and taking us to France again. The dish was effusing and channeling the rich unctuous animal aromas we smelled when we first entered the home, some many hours ago, into reality with what can only be called a chunk of prime animal with a well seasoned dense crust. The Prime rib came with a pair of dishes – teleported to France; one from the Shtetls of Hungary, and one from the USA. Remember, YC has a one track mind when it comes to cooking – meat and potatoes, and that was served up in aplomb! The dishes were potato kugel, Honey Roastede Butternut Squash, and Grilled chicken Paillard! Yes it sounds french, but like everything here in our lovely USA, we make it better! The prime rib was epic, it was crusty and meaty and absolutely melted in your mouth – it was truly impressive, in its actual quality and execution! It paired to perfection with the half bottle, or more, of the 2003 Covenant Cabernet Sauvignon! At this point – after gorging on meat and wine, much of the rest of the evening was a complete and utter blur. Thankfully, I was able to remember the dessert wine that I had brought over for our friends. You see, some 4 months ago, I was enjoying a family get together in Deal NJ, and we went to Lakewood, New Jersey to pick up some meat, and wine of course. While there we stopped at a shop called Wine on the nine in Howell, NJ. They have a very good selection of wines, though highly priced, and it was there that I found the last few bottles of 1997 Château de Fesles Bonnezeaux! This is a Chenin Blanc based dessert wine, that is richly aromatic, densely sweet, but perfectly balanced with bracing acid and oily texture. A wine to truly enjoy, and I am so happy we opened a bottle to share with our hosts! The bottles were brought to YC for friends, but I dipped into the collection and will just bring my bottle from home on my next trip. What can I say, I bought my bottle to share with friends, and YC and EC fit that bill perfectly! Dessert was a clear fusion of French and US culinary approaches. The Tartes de Pommes with Vanilla Bean Ice Cream – was crisp on the outside and moist yet firm on the inside. While the Double Chocolate Marshmallow Cookies – were a clear nod to the US need to chocolate-ize anything that is not pure protean in nature, though I have seen chocolate covered eggs. In this case two times chocolate was perfect for me, but the tart was where I was honing in my focus, which I must say was fleeting and bailing all at the same time. Still, I made good use of my cutlery and dove head first into what was the last two dishes of this epic Friday night dinner. What can I say, when I enjoy something, I see to it – that it is indeed enjoyed to the fullest! Maybe that is the kinship we shared, on this evening, with our hosts. They live life to its fullest – in both action and enjoyment, and that is what I truly took away from the evening’s proceedings, along with a healthy respect for YC’s liver and stomach! Thanks so much YC and EC – I can only imagine the effort it took to host us and to go so far off the deep end to prepare such a mind blowing and epic dinner – truly amazing and beyond the call of duty giving all that you two are going through now. Again, our truly heartfelt thanks and prayers! What can I say about this wine, really not much. This is a wine that has many of the classic Rioja characteristics, good earth, loamy notes, dark cherry, and a hint of spice. But they are all flat without any tannin structure, no complexity, and nothing to grab your attention. Even as a basic quaff wine this misses, because I could find no deep acid roots to balance out food. In the end, this is a wine that is good for white fish dishes and not much more. With the 2011 vintage Yarden has created a Cabernet that I can once again taste, but one that I still would not be interested in stocking up on. Sadly, for the past few years, since the 2008 epic vintage, Yarden has gone into the sweet tooth weeds and has been creating red wines that are far too over ripe for my palate. With that said, this vintage is OK, not overly sweet, but it still shows too much over ripe fruit to get me excited, as I can already see where this wine will be in a couple of years and I am not interested in where that is going. Still, if you must have a Yarden Cab, this is the one to get, if you cannot find any vintages earlier than 2009. The nose on this wine shows clear black forest fruit, with dark forest notes, and green foliage here and there. The mouth on this full bodied wine has a lovely fruit structure, that gives way to a richly tannic wine, blackberry, sweet cedar, plum, and dark cherry, all wrapped in a ripe fruit cocoon that is a bit too far off field for me. The finish is long and spicy with toasty oak, vanilla, Oriental spice, and leather. OK, to start this wine is unique, not so much that it is a Viognier/Roussane blend, there are a few folks doing that in the kosher world now (Recanati and others). The real unique aspect is that the Weiss brothers decided to let the bitter and earthy notes of the Roussane take a center stage for this wine, at least for part of the time. That is not a flaw to me as much as it is a shocking aspect that needs time for some to get used to. Once you are past this issue – this wine rocks my world, and at 25 bucks a pop, many could really appreciate this wine for almost any meal, other than a steak! The nose on this straw to light gold colored wine is the clear and utter winner of the wine perfume competition! Are you kidding me, this nose is 100% certifiable, with rich and honeyed notes of dripping honeysuckle, lovely jasmine, impressive floral notes, all backed by very impressive earthy mineral components, and ripe melon. The mouth on this medium bodied wine is where some will be shocked and some will love, quite a polarizing context that is well worth enjoying, with lovely layers of honey, spice, guava, ripe Asian pear, along with an intense salty quality, that backs the mineral structure of this wine that exhibits a lovely oily texture, and good sweet apple sauce. The finish is where the shocker starts, crazy bitter citrus pith takes center stage with good almond notes, along with straw components, all finished above a bed of lovely slate/rock and richly mineral focus. This is a wine that will vex you, sometimes the wine is sweet, sometimes bitter, sometimes minerally focused, but always enjoyable, BRAVO!! I heard about this bottle and when I saw it available in a wine store, I could not help myself and had to pick up a bottle. The wine is a 375ml bottle and is worth every penny that I paid for it. I must say that if I was told this was made from Chenin grapes, without seeing the bottle, I would have laughed at the person telling me. All I would be thinking was; no way, this wine is pure botrytis and is all about sauterne to me. NOPE! This is a Chenin wine and is begging for some foie gras and blue cheese (not at the same time if you eat kosher)! The nose on this dark colored wine screams with intense honey, honeysuckle, peach, apricot, ripe summer fruits, dried fruits, and tea. The mouth on this full bodied wine is richly layered with crazy sweet funk, followed by acid, more sweet summer fruits, honeyed notes, a body that keeps on giving with depth and concentration and a viscous body that is mind blowing with an acidic core that does not stop! BRAVO! The finish is long and sweet with a density, citrus, a drop of orange peel, and nectarine jam covered with vanilla. Truly an honor to have enjoyed this wine with my friends! BRAVO!!! This is a wine that is made in many batches by Royal Wines and the highly respected Port lodge of Taylor Fladgate. This wine is dark and almost black in color with a nose of dark fruit, candied berries, and dark cherry. The mouth on this full bodied wine shows clear alcohol notes, caramel, candied and oxidized black fruit, and mounds of cinnamon. The finish is long with great spice, almond paste, walnuts, chocolate, caramel and sweet spices on a long finish. 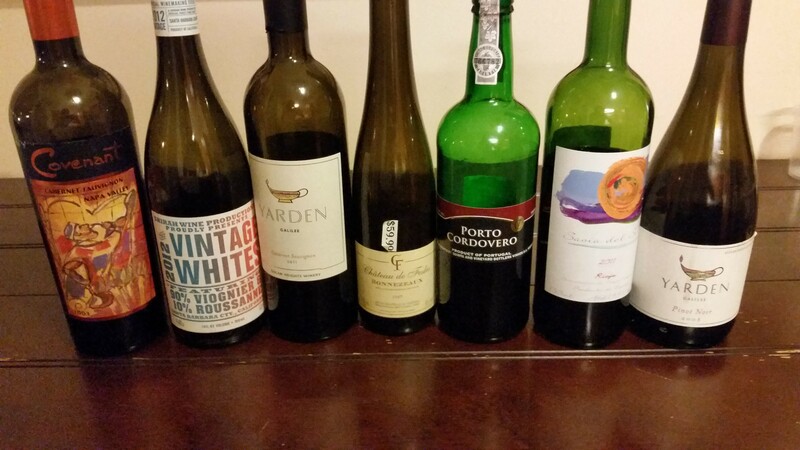 Posted on December 18, 2014, in Food and drink, Israeli Wine, Kosher Red Wine, Kosher White Wine and tagged Bonnezeaux, Cabernet Sauvignon, Chateau de Fesles, Cordovero, Covenant Winery, Pinot Noir, Porto, Rioja, Savia de Sol, Shirah Winery, Vintage Whites, Yarden Winery. Bookmark the permalink. 3 Comments.